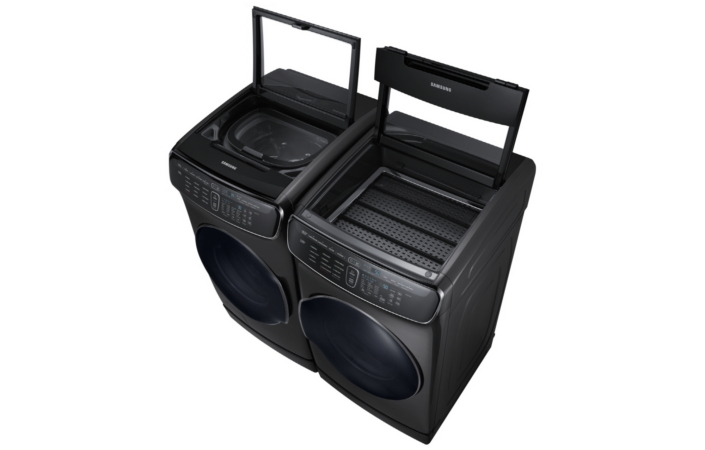 Samsung has announced FlexWash + FlexDry laundry system which will be showcased at CES 2017 in Las Vegas. This versatile laundry pair was designed to offer two washers and two dryers in one system, giving consumers more choices to do laundry the way they want, in all types of situations. Incorporating a range of core Samsung laundry technologies, FlexWash™ + FlexDry™ provides the most advanced, flexible laundry solution to meet the needs of busy modern families. Within the two machines, each distinct laundry compartment includes unique features to tackle wash day needs. The FlexWash™ front-loader is equipped with five cubic feet of capacity — the largest in its class1 — to handle normal or bulky loads. Meanwhile, the FlexWash™ top-loader adds another cubic foot of capacity and is built to wash smaller loads separately from the main load. To power through big laundry loads, users can operate both washers at the same time with different settings. To dry fabrics, FlexDry™ has the ability to tackle large laundry loads with the added flexibility to dry a few delicate items at the same time. Users can lay clothes flat in the unique Delicate Rack zone at the top of the dryer and gently dry delicates with a controlled, heated air flow. The special zone adjusts the heat between room temperature and 95 degrees Fahrenheit automatically depending on the type of fabric being dried. The main dryer compartment also uses Samsung’s MultiSteam technology to freshen and disinfect clothes while reducing odors and wrinkles.